These mini morsels are filled to the brim with flavor to punch you in the mouth and make your tummy say “mmmm”. Now that spring has given way to summer in my neck of the woods my grill will be going pretty much non-stop until snow threatens, with the occasional pause for a tornado siren. 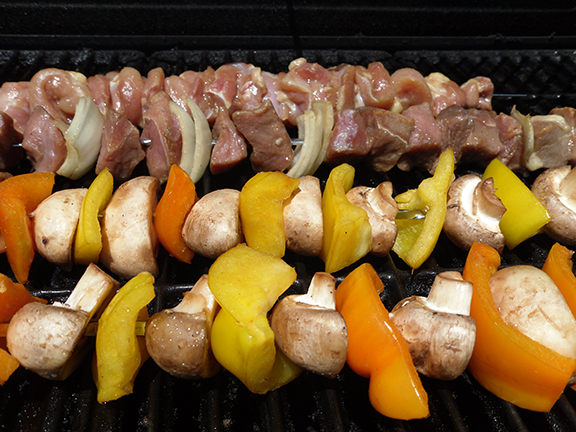 I like to use more than one type of meat when I make kebabs to keep the flavors varied. The meats pair differently with the vegetables, makes you notice a new nuance to the flavors, plus it keeps you from getting bored. For this afternoon I used chicken thighs and beef sirloin. My veggies are mushrooms (a fungus I know, but I don’t hold that against them – I’m still waiting on one to make me 10 feet tall), yellow and orange peppers (if you only use green you don’t know what you’re missing, the other colors are sweet and better for you), and onions. For the best flavor layering, marinate both the meat and the veggies. This is a gluten-free and low carb recipe so long as you check your soy sauce or use Bragg’s Liquid Amino instead. Cut your veggies into 1″ square pieces, larger/smaller is fine as long as everything is relatively the same size in relation to one another. This aids in cooking to a uniform doneness in the same amount of time. 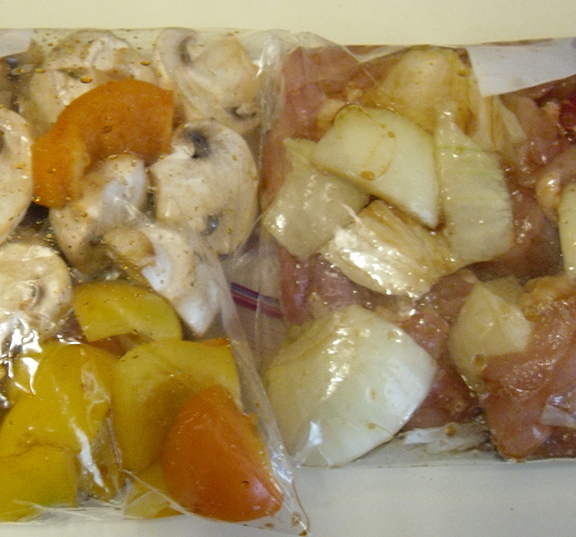 Place the veggies together in a zip top bag with half the marinade. Hack up your steak into 1.5 inch pieces, this will let you control the temp a bit if you don’t want it well done. We do medium around our house. Cut the chicken into half-inch wide strips, these will be skewered twice through each piece to minimize slipping and spinning. The muscle fibers in the thigh plus the additional lube from the olive oil make these little buggers slippery. Marinate in the fridge for 1 to 8 hours. Now for the gloriously messy but oh so fun part: poking things with sharp sticks! Now if you are a stick poking novice, let me give you a word of advice. Place the item to be skewered on a cutting board and poke the stick down into the item so the cutting board takes the residual poke, not your hand. If you are a little braver, you can try holding the skewer-ee in two wide-spread fingers and aim the skewer into the space between your own meaty bits (ie. your fingers). Perhaps I should have said this first, only put like items on skewers! But it looks so pretty to alternate between meat and peppers, and ooh look at the colors. I hear you, but that only works in movies and cook book photos. Do you want charcoal for onions? Do you want overcooked beef or under cooked chicken? Yeah, me either. So put your veggies together. These take the least amount of time to cook. Put onions and peppers together, chicken by itself and beef by itself. Another important lesson: leave space between the food. Ever wonder what exactly the magic is about kebabs?? Surface area! 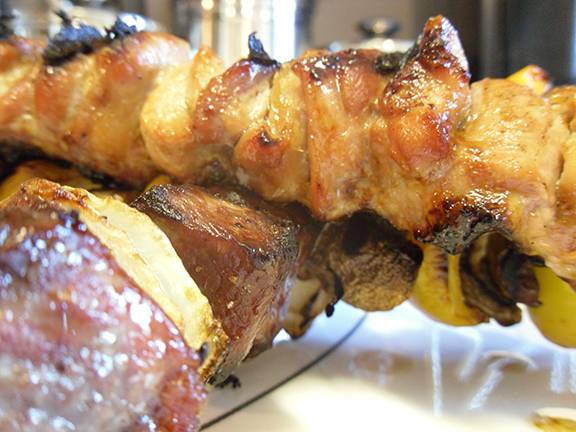 More edges for flavor to seep in, now don’t mess that up by overcrowding your skewers. You’ll also risk uneven cooking, see above note about over/under cooked. Now, fire! No, not the cannons – the kebabs. Get thee to the grill. You know your grill best, get a temp good for chicken (usually hotter than for beef) and watch everything closely. Now here’s a little secret you might not know about meat: it will release itself from the cooking surface it’s sticking too when it’s nearly done! Now if you didn’t use any lube at all, it may just plain ole be stuck, but this general principle applies to most cooking methods – that’s why breading stays stuck to the frying pan when you fiddle with your meat too much, but if you wait till a side is done to flip you retain your coating. The mushroom will come off first, then other veggies, beef and chicken last. Let the meat rest for 5 minutes tented in foil. Use a wide-set fork and start pulling the pieces off from the bottom, working your way up – steady the skewer on a cutting board (not the one from the raw food!!) to prevent any accidental stabbings. Serve with pita and a sauce of your choice. Happy noming!